The Bigfoot Triple Package from Anchor Audio includes a BIG-8000CU3 Bigfoot Sound System, two WB-8000 Belt Packs, one CM-60 Collar Mic, one HBM-TA4F Headband Mic, and one WH-8000 Wireless Handheld Mic. The BIG-8000CU3 Bigfoot Sound System is a portable line array speaker that folds up into a durable case with wheels. 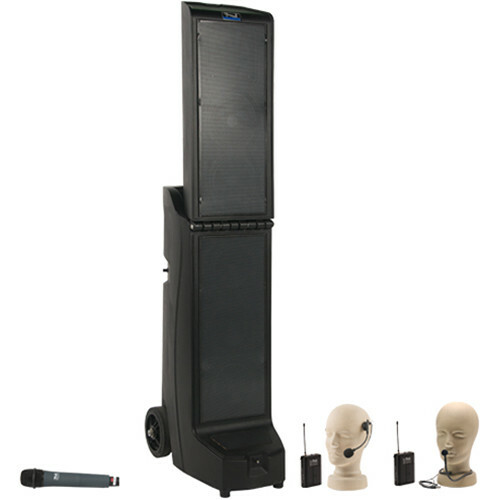 The speaker stands 6' high and can be unfolded quickly. BIG-8000CU3 has five 8" neodymium woofers and one 1" high efficiency compression driver. It includes a built-in CD/MP3 combo player and triple built-in 16-channel UHF wireless receivers. It has built-in rechargeable batteries, which operate 6 to 8 hours on a full charge, and includes a battery level bar indicator on the back. The Bigfoot also comes with built-in Bluetooth, a USB port for charging an MP3/iPod, and two universal microphone input jacks. The system is suitable for outdoor activities like sporting events, graduations, outdoor camps, auditoriums, and more. For use with the included mics, the package comes with WB-8000 Bodypack Transmitter. The WB-8000 UHF Bodypack Transmitter can be used for various applications like live sound, TV broadcast, boardrooms, conferences, public speaking, and more. It features 16 channels and can run on two AA batteries for approximately 20 hours. The WH-8000 Wireless Handheld mic features 16 UHF channels. It operates on 540 to 570 MHz frequency. The battery-powered BIG-8000CU3 Bigfoot portable sound system from Anchor Audio offers 130 dB of clear sound combined with a radiant output of 400W that can reach crowds of 5000 people or more, at sporting events, school functions, outdoor camps, military ceremonies, and more. It transports easily when closed and reveals a large line array (6'9" tall) when open. The five 8" subwoofers & the high-efficiency compression driver deliver a sound that is evenly distributed and which travels farther than with traditional speakers. The BIG-8000CU3 features a built-in Bluetooth receiver, a CD/MP3 combo player, and three built-in wireless receivers with sixteen user-selectable channels. It is also equipped with two balanced mic inputs which accept XLR and 1/4" plugs, and two stereo line inputs which accept 1/4" and 3.5mm plugs. The 1/4" line output allows for daisy-chaining multiple Bigfoot speakers for extended sound coverage. Three rechargeable batteries provide six to eight hours of operation at medium volume, while a real-time battery indicator allows you to always know your battery life. External devices can be charged or powered by using the USB port. The Bigfoot features a durable & UV- resistant case, a contoured handle grip, and heavy-duty wheels, and it can be set up quickly with no stand required. It is built in the USA. The Anchor CM-60 collar microphone is designed to be worn underneath collars for discrete operation. The microphone features a cardioid polar pattern and TA4-F terminated cable. The Anchor HBM-TA4F is a lightweight headband microphone designed for hands free operation. The microphone features a cardioid polar pattern which is effective in minimizing noise at the off-axis sections of the microphone. The cardioid pattern provides high gain before feedback making it suitable for use near monitor speakers. The microphone is fixed to a flexible boom for easy positioning and optimum pickup. The cable is terminated with a Switchcraft TA4F 4-pin mini XLR plug, compatible with Anchor wireless body pack transmitters. The cardioid polar pattern results in high gain before feedback, making it suitable for use near monitor speakers. The microphone is stationed on a flexible boom for easy positioning and optimum pickup. The cable length measures 36" and terminates to a TA4F mini XLR connection, compatible with Anchor wireless transmitters. Box Dimensions (LxWxH) 44.0 x 25.0 x 17.0"
Box Dimensions (LxWxH) 10.63 x 2.835 x 2.362"
Box Dimensions (LxWxH) 8.3 x 3.1 x 2.5"
Box Dimensions (LxWxH) 8.3 x 6.6 x 2.4"
Box Dimensions (LxWxH) 7.0 x 5.7 x 2.4"